Removed from an official Nerf blaster set. BCP SKU: SKY2863. 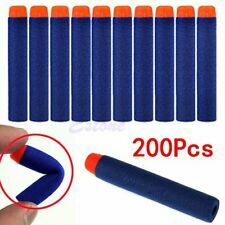 Best Choice Products Kids Softs Foam Dart Blaster Toy Combat Battle Set w/ Long Distance Range, 20 Darts - Multicolor. Grab your foam dart shooter and join the fight, soldier! 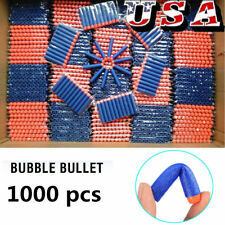 This toy blaster lets kids conquer the battlefield with soft dart bullets and a cool, colorful semi-automatic design. Item: Kids Toy. Feature: Hollow. Colors: White & illuminate. Note: Due to the difference between different monitors, the picture may not reflect the actual color of the item. Material: EVA. Tested and working with blue elite darts. The cylinder automatically holds the air restrictor in the open position allowing you to use shortened darts without having to ramrod each dart when loading. You can also stack two short darts in the cylinder for double shots with reduced range. Tested and working with 2 Nerf Demolishers. Darts not included. Blaster & Foam Play. Bandolier shoulder strap darts ammo storage for NERF n-strike blasters. Bandolier can storage 1 quick reload clip (not included) and 20pcs bullet(not included). Size: Length: adjustable rope. In warm weather, a squirt gun can be an entertaining way to get outside, enjoy the sunshine, and have fun with friends. 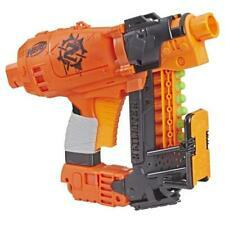 One option is the Nerf Longstrike CS-6, a long-barrel blaster with a single-fire clip system. This clip system blaster was originally released in 2010 as part of Nerf's N-Strike series and was designed to fire a dart per second via the N-Series' bolt-action priming mechanism. What accessories come with the Nerf Longstrike CS-6? Each Nerf CS-6 package includes an instruction booklet, a storage stock, a detachable barrel, a clip for six darts, and six Streamline darts. The blaster’s design features an extendable barrel, a flip-up sight, and a storage area for a second clip. The Nerf N-Strike CS-6 was designed with four tactical rails. Its tandem rails are located on top of the blaster, with two additional rails located on the blaster's barrel extension. What colors does the Nerf Longstrike CS-6 come in? Like all other blasters in Nerf’s N-Strike series, the Longstrike CS-6 was released in the standard N-Strike color scheme: blue, yellow, black, gold, and orange. Nerf also released this longstock blaster in two additional options: the Sonic Series and the Whiteout Series. The Sonic Series comes in a clear green and orange color scheme, while the Whiteout Series features a white, black, and orange color design. How do you reload and fire the Nerf Longstrike CS-6? To load and reload the long blaster, pull the bolt back and press the clip release button located on either side of the blaster. This will release the clip from your Nerf gun. Use the appropriate darts and load the clip. Then, reattach the clip when you’re finished. Once the clip is loaded and reattached, the Nerf gun will need to be primed before firing. To prime the Nerf gun, push the bolt forward. Pull the trigger and one dart will fire. Cycle the bolt back and forth to empty the clip for subsequent shots. How far can a dart from the Longstrike CS-6 fly? When the clip of the Longstrike CS-6 has been properly loaded and primed, a dart can travel up to 35 feet. In addition, the barrel of the CS-6 is extendable. You may be able to increase the ammo's firing distance by making sure the blaster is properly primed, by installing the clip correctly, and by pulling the trigger with medium pressure. Content provided for informational purposes only. 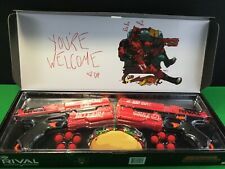 eBay is not affiliated with or endorsed by Nerf.